Munich Security Conference Chairman Wolfgang Ischinger on his wishes and concerns for 2019. What do you see as the greatest international political challenge of 2019? It’s not a single issue but a general problem: the world lacks an anchor of stability. Rules are being broken, institutions ignored or maligned. That creates instability and unpredictability, and it’s dangerous. I’m not sure whether we would really be capable of keeping a real crisis in check. On what–and on who–could we rely on in an emergency? Do you agree that we live in a time of great upheaval? And what is driving this development? Yes, one day people will look back on this time as an epochal watershed. Many foreign policy certainties are all of a sudden in question. That has partly to do with global, strategic power-political shifts, but partly also with domestic political developments in important countries. In an ever more complex world, should every country reflect on itself, or is more cooperation the future? Do we need new institutions? Efforts to find our salvation in a new nationalism will lead to a dead end. I hope that we don’t have to learn this lesson over again. But unfortunately, at present, the principle of multilateralism is well and truly under pressure. New institutions won’t solve this problem, though. We need to make better use of existing institutions. Which three issues are a special focus for the 2019 conference? The future of transatlantic relations, the self-assertion of the EU, and the danger of escalating great power rivalries. Do you have a favorite memory from a Munich Security Conference, a greatest moment? Joe Biden’s 2009 appearance at the first security conference where I was chairman is a special memory for me. Biden gave the first important foreign policy speech of the new Obama administration and generated a feeling of optimism about a reset–not just with Russia but also in the transatlantic relationship. One result of that was the New START treaty. What have you found especially unpleasant? The increasing tendency of top politicians from the EU to refuse to sit on the same stage as certain colleagues. In the past that only happened when countries had been enemies for decades. That massively upsets me¾and makes me sad. Which result of a conference were you particularly pleased about? One of the principles of the MSC is that we don’t produce any communiqués. We try to offer the best possible platform for an exchange, thereby creating or keeping open possible courses of political action. That frequently works, but it often takes years before we see the results. The American-Russian disarmament negotiations or the rapprochement between Kosovo and Serbia are good examples. If it all culminates in something years later, it makes me really happy. When the world is doing badly, it’s good for the MSC, right? The attention over the past few years has certainly increased even further. But we would love to be able to have a conference totally dedicated to long-term challenges rather than dominated by the many crises roiling daily politics. What’s the one thing an MSC can’t go without? The big names! What is never allowed to happen there? If we are in danger of stirring up tensions around an issue rather than having a positive influence, then our sense of responsibility demands that we don’t even spark such a debate. Is there a guest still missing from your “collection”? The Pope! So far, though, we haven’t had a US or Chinese president as a guest. I’m really pleased about the huge interest we get from every part of the world–from Australia to Iceland, from Rwanda to Mongolia. John McCain will really be missed at the MSC–do you see anyone as a potential successor? John McCain was the best friend the MSC had in the US Congress. He leaves a big gap behind. But Senators Lindsey Graham and Sheldon Whitehouse have been coming for many years. They will–and I’m very confident about this–continue to bring a strong “co-delegation” to Munich in the coming years, fully in the spirit of John McCain! This year’s MSC will take place on February 15-17. Berlin Policy Journal and its sister publication Internationale Politik are again the MSC’s media partners. Click here for an overview of our reporting from the MSC. 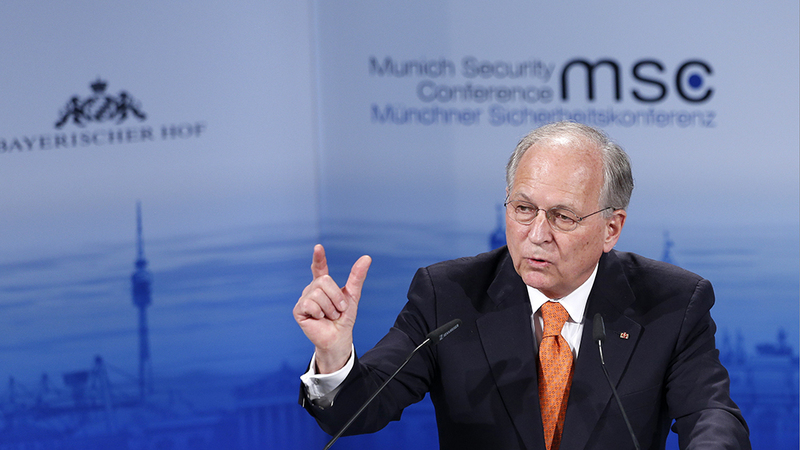 is chairman of the Munich Security Conference and teaches at the Hertie School of Governance in Berlin. A former deputy foreign minister of Germany, he served as ambassador to the United States from 2001 to 2006.